Note: The audio is pretty loud so you may want to lower the volume on your speakers. This ocean cam is affixed to the Frying Pan Tower, 34 miles off the coast of Cape Fear, North Carolina. The tower was built in the 1960s to warn ships of the shallow waters nearby. Though GPS navigation technology means this tower is no longer used for its original purpose, it’s an important ecosystem for marine wildlife (check out the underwater shark cam to see what we mean) and provides a beautiful view of the sun rising and setting over the Atlantic Ocean. 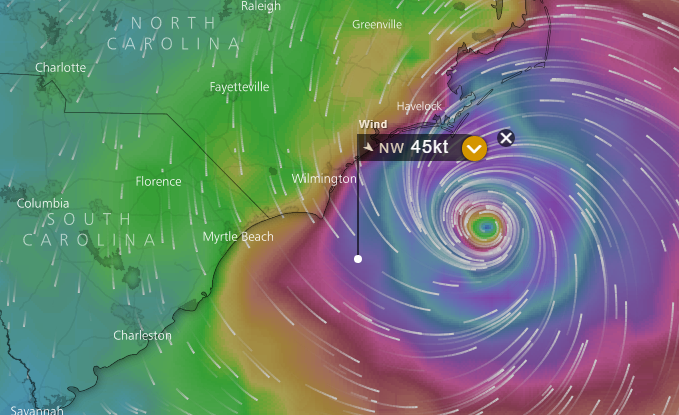 Windy.com also provides some cool interactive data and shows you the location of the cam in relation to the hurricane. This is from the time of this posting.